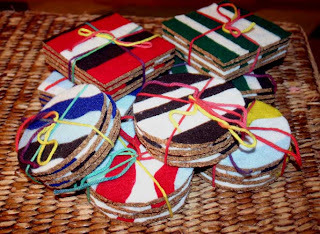 The kids made cute lighted jars as Christmas gifts this year, but I saw this idea for making felt coasters in the Family Fun magazine and I really wanted to try those too. 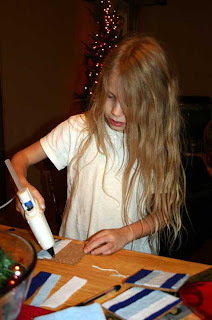 The article called for a roll of cork and self stick felt. Well I didn't find either. So I used these cork tiles that I found at Walmart in the office section and we used regular felt squares (super cheap at JoAnns or Walmart) and I used a hot glue gun to glue them on. 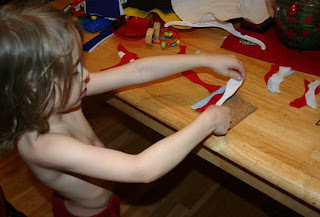 Though they weren't hard to make, it would have definitely been easier to use self stick felt. I did most of the gluing (hot glue is called HOT glue for a reason) but I did let Xian glue some. I also did most of the cutting of the felt because you kind of have to be precise. 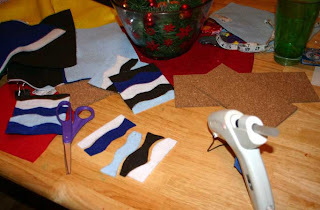 I let Piper put the pieces of felt on the cork but for Arah and Ever mostly I just let them pick out the colors (we tried to use colors to match the decor of the family we were giving them to) and the order of the felt pieces as I placed them on the hot glue and then they patted them down. 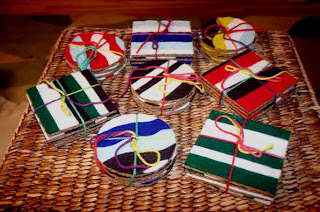 We did 4, 4x4" coasters per family, and to make the wavy lines you have to cut 4 pieces of felt (I made the pieces a little larger than 4x4" each) stacked on top of each other . . . then you can mix and match the colors on each piece of cork and the lines match up because they were all cut the same. I did wavy lines on the first few but then got tired of them and just did straight lines (of varying lengths) on the others (it was just easier). Then some I cut into circles using the top of a cup as a guide. I really liked how they turned out! Thanks for them. I think Piper made ours, so thanks again. We're already using them and love them. OK crafty lady, I should have come by earlier for some inspiration. We actually just started getting Family Fun magazine, but I wasn't feeling up to doing too many projects this year. But I think I'm going to read your blog more often, and give into Meg's many requests to craft more often as well. 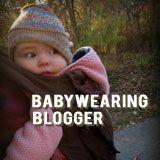 And I haven't even posted pictures of my crayon cozies yet (tonight I will), or the aprons I made the nieces for christmas (or the snuggies, I made 7 of those, or the birthstone necklaces I made for my sisters and mom . . .geez too much). I have just been in a crafty mood lately. In fact right now I am heading to the sewing machine to start on 2 pointy kitties (stuffed animals). One for Piper and one for another niece for this weekends family get together. Of course Thrace is still awake so on my back he goes! !